Becca Small casts her vote at the Cross Insurance Center in Bangor on Tuesday. AUGUSTA, Maine — Maine voters on Tuesday showed again that they strongly support taxpayer-funded political campaigns when they added new money and transparency requirements to the state’s Clean Election system on the statewide ballot. Now it will be up to the Legislature to determine where to find that money when it reconvenes in January. 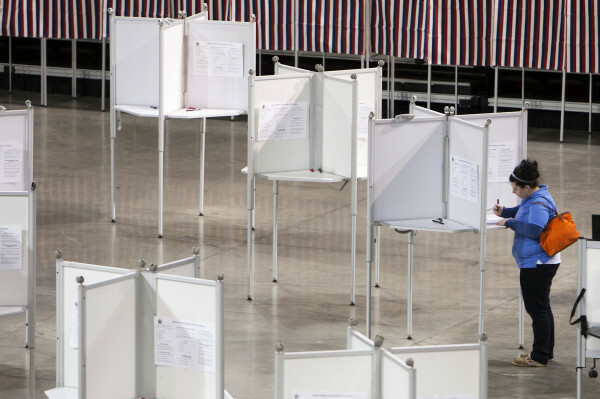 Question 1, which implements reforms to Maine’s taxpayer-funded Clean Election system, showed the citizen-led initiative in a tight race for most of the evening, with “yes” votes pulling ahead late in the evening. The initiative, which has seen a flood of activity from opponents and supporters in recent days, was the closest race among three statewide questions posed to voters on Tuesday. All three passed. Maine’s Clean Election system was launched in 1996 by citizen referendum with the intention of reducing the amount of private money in state elections. Participating candidates can collect small-dollar campaign contributions for the Maine Clean Election Fund in exchange for having their House, Senate or gubernatorial race funded with public money. Clean Election candidates are barred from raising private donations. Previously, the fund gave $5,366 to House candidates in primary and general elections, $25,483 to Senate candidates and $1 million to gubernatorial candidates. In recent elections, those sums, especially for Senate and gubernatorial races, fell short of what some privately funded candidates have spent on their campaigns. Under the new formula, gubernatorial candidates will be able to receive a maximum of $3.2 million, Senate candidates $65,000 and House candidates, $16,500. Question 1 will raise allocations to the system from $4 million to $6 million in every two-year budget cycle. Though it doesn’t dictate where that money would come from, it requires the Legislature to eliminate “low-performing, unaccountable” corporate tax breaks that don’t demonstrate an “economic development benefit” as defined by the Office of Program Evaluation and Government Accountability, which already has a proposal to evaluate business tax breaks. The new law also increases penalties for campaign finance violations and adds new disclosure requirements. Proponents of the measure, who call themselves Mainers for Accountable Elections and who have raised more than $1.3 million from mostly out-of-state donors, were organized months before the opposition, framing the initiative as a chance to increase election transparency, further eliminate special interest money in politics and make it easier for more Mainers to run for office. Alex Youn, campaign manager for Question 1, said the result in Maine will reverberate in other states where voters are becoming fed up with too much money influencing elections. Andrew Bossie, director of Maine Citizens for Clean Elections, agreed that Maine could be a trigger point for wider election finance reform. Dana Connors, president of the Maine State Chamber of Commerce, has been one of the most vocal critics of Question 1. He said he was pleasantly surprised that the vote was so close. Rep. Joel Stetkis, R-Canaan, who played a lead role in the campaign against Question 1, said at about 10:20 p.m. that he was holding out that smaller towns across Maine could still swing the result to the “no” side. An opposition group called Mainers Against Welfare for Politicians formed in September and has mounted a short but spirited campaign against the measure. Their message has been that taxpayer-funded elections are a waste of limited public resources and do little to eliminate special interest money in elections.